A flow cytometer used by immunologist Hyun Lillehoj analyzes intestinal lymphocytes that indicate chickens’ immune response to coccidia exposure from vaccination or natural infection. If ever organisms lived up to the label “parasite,” it is those belonging to the order Coccidia. Not only do the single-cell protozoans of the Eimeria genus infest the nation's poultry flocks, costing American producers an estimated $600 million-plus annually in medication costs and lost production; they also invade and take shelter in the very cells marshaled by the chicken's immune system to defeat them. Though a vaccine is available in this country against coccidiosis, its key ingredient is a low dose of the live parasite, which stimulates protective immunity. But Hyun S. Lillehoj, who is an immunologist with the ARS Immunology and Disease Resistance Laboratory at Beltsville, Maryland, says the presence of the live parasite may pose problems. Complicating the vaccine situation is the existence of seven different species of Eimeria. Lillehoj favors a different approach. She and her research team—including support scientist Marjorie B. Nichols and technician Melody B. Lowe—have devised a two-pronged strategy to thwart coccidia. “The chicken’s immune system produces cytotoxic T-cells whose function it is to target and destroy infected cells,” explains Lillehoj. “That’s part of nature’s protective immune mechanism against this parasite. Once nestled in crypt epithelial cells, the thriving coccidia wreak havoc in the intestinal lining and interfere with the chicken’s ability to absorb nutrients from the feed it has eaten. Result: The bird doesn't gain weight and may die. In 1993, Lillehoj and ARS immunologist James M. Trout observed coccidia’s commandeering of cytotoxic cells firsthand when they used two fluorescent, color-stained monoclonal antibodies to cling to and track movement of both parasites and cytotoxic cells inside chicken intestines. Green-stained monoclonal antibodies allowed them to see where the coccidia went; red-stained antibodies pinpointed the presence of the cytotoxic cells. Overlapping red and green colors proved the coccidia invaded the very cells that were supposed to protect the chicken against them. Part of Lillehoj’s plan is to block the initial invasion of those crucial infection-fighting cytotoxic cells by the coccidia. “The sporozoite has to bind to the cytotoxic cell to get inside it,” she explains. “Once it binds, it makes a little dent on the cell. The parasite has a retractable structure called a conoid that makes this dent. Then enzymes from the parasite act on the cell to make an opening for the parasite to get in. 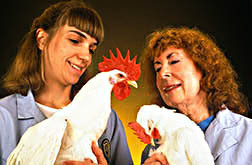 Support scientist Marjorie Nichols (right) and technician Melody Lowe examine leghorn chickens of the TK strain for signs of coccidiosis. The one on the right is infected with Eimeria tenella, which results in a smaller comb, diarrhea, and weight loss. Lillehoj is working with ARS molecular biologists Mark C. Jenkins and Kang D. Choi on ways to use the protein recognized by the antibody as a potential vaccine. Also promising as potential weapons are cytokines, substances produced naturally by the bird’s white blood cells. We have shown in laboratory tests that some cytokines inhibit development of the parasite,” says Lillehoj. "They also enhance cytotoxic activity by turning precursor cytotoxic cells into active cytotoxic cells. Once activated, these cytotoxic cells kill parasite-infected host cells. Cytokines also activate white blood cells called macrophages to devour the parasites." Starting in 1995, Lillehoj collaborated with ARS molecular biologist Dante S. Zarlenga and scientists at Korea's Seoul National University to clone the chicken gene that controls manufacture of a cytokine called gamma-interferon. The research team has produced genetically engineered chicken gamma-interferon and is testing its protective powers in live chickens. Early results look promising, Lillehoj says. "If this works, a bird that's treated with the gamma-interferon might still get infected with coccidia, but it might not lose as much weight or get as bad a case of coccidiosis," she explains. "You wouldn't want to completely block the infection, anyway, because then you wouldn't stimulate the bird's immune system to provide natural immunity against future coccidia infections or other opportunistic pathogens." Gamma-interferon may prove useful in the battle against coccidia in other ways as well, Lillehoj adds. "Antigens are proteins from the parasite that stimulate an immune response from an animal's immune system," she points out. "It's been shown in mammalian cells that when you add gamma-interferon to a weak antigen, you get a greater immune response than if you just vaccinate with the antigen alone. Plans are under way to use gamma-interferon as an adjuvant to enhance the action of the vaccine." Mass production of gamma-interferon may be tricky, Lillehoj says. In lab tests, attempts to reproduce the substance by inserting the gene for its production into fast-multiplying E. coli bacteria fell short of the scientists' expectations. "The protein was not very effective when expressed in E. coli," Lillehoj admits. "But once you have a gene that expresses the protein, you can raise it in a mammalian cell line." One possible solution to the protection dilemma might be to identify an antigen common to all strains of coccidia and use that as the basis for a new vaccine. "We know of one such segment, but we're not ready to test it yet as a vaccine," says Lillehoj. The more common game plan—waiting to clean up coccidiosis in flocks after it occurs—is rapidly becoming a risky proposition, according to Lillehoj. The ARS research team's multifaceted efforts come down to one simple goal: to mimic nature. "In the field, once birds have been exposed to coccidia, they develop immunity," says Lillehoj. "We've been trying to figure out how chickens get that immunity. Over the years, we've learned a lot about how the parasite invades cells and stimulates natural immunity." — By Sandy Miller Hays, ARS. 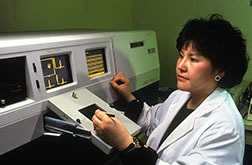 Hyun S. Lillehoj is at the USDA ARS Immunology and Disease Resistance Laboratory, Bldg. 1043, 10300 Baltimore Ave., Beltsville, MD 20705-2350; phone (301) 504-6170. "Two Strategies for Protecting Poultry From Coccidia" was published in the October 1996 issue of Agricultural Research magazine.